English clog dancing (at least in the revival) is largely about formal, composed dances, but I have become increasingly interested in the possibility of improvisation in clogs and by improvised traditional step dance forms such as East Anglian and Southern Stepping in England, Irish Sean-nós and American Flatfooting. 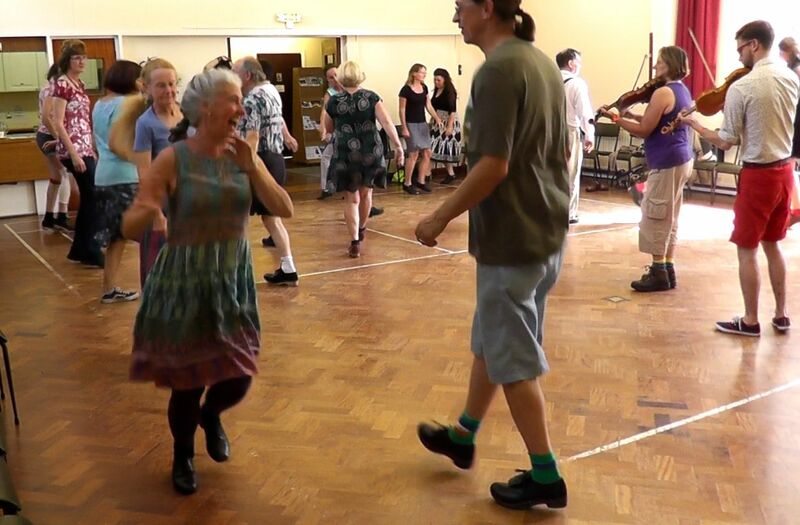 I have also been inspired by a few step dance pub sessions I have been to recently, and the work by Jo and Simon Harmer and Kerry Fletcher to promote the ‘Southern Stepping’ that they have learnt from Romany families in Southern England. As I have a particular affinity with Lakeland step dancing I wondered what improvised Lakeland stepping would be like and whether I could use this as a way into improvising in my own dancing. We know that, in the Lakes, people used to step dance informally during social dances and at other social gatherings such as at parties after sheep shearing. Sometimes they danced in clogs and sometimes in hard shoes, but we don’t know much about what this stepping was actually like. However, we do have records of the more formal clog steps taught there by the travelling dancing masters, and I suppose it is a reasonable guess that they used some of these steps in their informal stepping. These steps, then, were the main resource I had when I tried to reconstruct ‘Freestyle Lakeland Step Dancing’ or perhaps ‘Social Stepping – Lakeland Style’. Looking at other improvised step dance traditions it seems that most dancers use a relatively small set of basic units that they combine in a variety of ways, the interest is in the dancer’s individuality and the multiplicity of ways in which those units can be recombined to the music rather than the complexity and novelty of the steps themselves. Whilst playing around trying to recreate the Lakeland style I realised that a few of the simpler recorded step units could be used in a similar way to certain American flatfooting steps: they could be learnt very quickly and used to provide a very simple but infinitely variable foundation for the dance. Fortunately, Lakeland stepping also contains many other simple steps that can be added for variety and visual effect, all without recourse to more advanced technique. But the steps on their own aren’t enough, the music is crucial to understanding these step dances. As a starting point I wanted to use Lakeland Hornpipes played in an un-dotted rhythm, which is how the Lakeland step dance records suggest they were played. I am lucky enough to work with two great exponents of this style in fiddle players Carolyn Francis and Scott Hartley both of whom have frequently accompanied me with some fantastic Lakeland tunes such as Keswick Bonnie Lasses and Elterwater Hornpipe. Working with their music has really helped to bring this dance to life. My first proper chance to teach this material came as part of Instep Research Team’s ‘Social Stepping’ programme at Sidmouth Folk Week 2013. The workshop went well and by the end of it there were a lot of people dancing around using the steps I taught them, and enjoying it! One person commented to me that they looked much more as if they were ‘dancing’ than in clog workshops where a routine was taught. I did notice that some of those who already knew some formal Lakeland step dancing seemed to want to fall back on the longer step patterns that they knew, rather than let go and improvise with the smaller units, but that’s OK, it is quite a different way of approaching the dance and it can take time to let go of old habits. Not only has this project has been a useful way for me to start to explore improvisation in my own dancing, I also think this way of approaching the dance is exciting for its own sake. Dancing this material is great fun; it can be done by more or less anybody with a pair of hard-soled shoes and can be danced solo or with others in social settings such as a pub session or during a dance at a ceilidh. 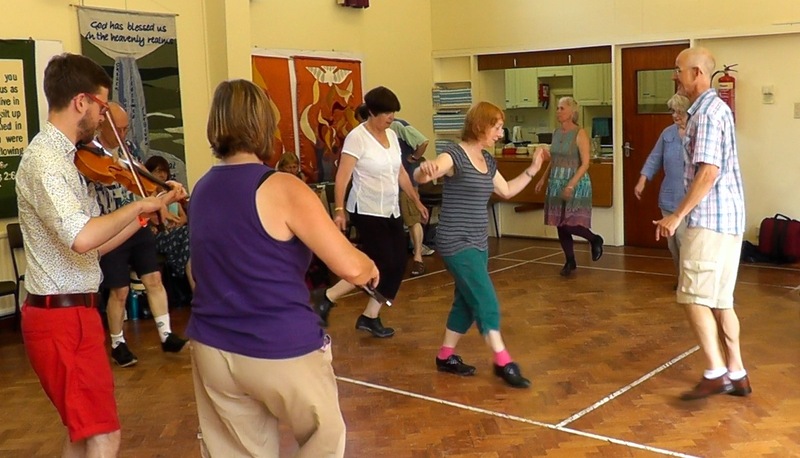 I plan to continue to teach it both as a social/freestyle form and, perhaps, as a way of introducing formal Lakeland step dancing to beginners, hopefully giving them a sense of spontaneity and the lively style of the dance that they will be able to carry into more complex dances later. Who knows whether my Social/Freestyle Lakeland Stepping is in any way ‘authentic’? We will never know, but I think it’s probably as good a guess as any for the moment – and if it works, why not? Thanks Toby – this does look fun! I’ve been thinking for a while now, that this is the way to go. 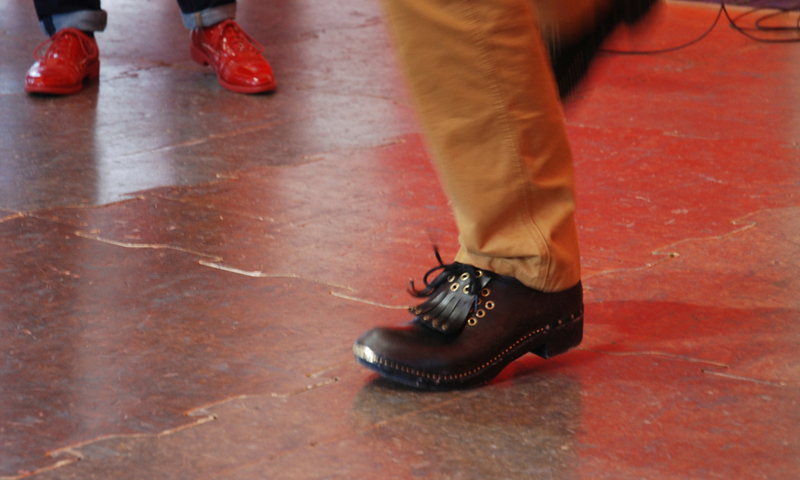 After all, we improvise both music and percussion at folk sessions, so why not with clog step dance? I must admit, I get bored with Music Hall routines, although it’s one way to learn some steps. If you regard step dancing as percussion, then it’s obvious – just go with the music as you feel, but match the tune. Keep it up Toby. I must get to one of your workshops, but I live in the SE, where there aren’t many.